Pickles may not be a required food group but they are close to the top of my food preservation list. They are particularly appreciated when the salad ingredients are sparse while the garden rests during its long hibernation. Pickles are why I grow and love cucumbers. Cucumbers are good eaten fresh, too, of course, but mine prefer to be pickled. So the cucumber I grow is the pickling sort. I’ve trialed many open-pollinated varieties and so far Northern Pickling is the choice for my garden. Cucumbers love warmth and space but there are varieties that can suit a wide range of environments, from bush sorts for the small plot or those that can be trained up a trellis, ones that are more adaptable to the hot and dry or varieties that handle the cooler climes with finesse. The best way to choose the variety (or varieties) for your garden is to experiment with many different ones, then grow what does best for you. If your garden is healthy and the soil reasonably rich in humus, you will probably grow great healthy cucumbers. But even when I was still building up my depleted sandy-loam soil I was able to get a small but usable cucumber crop. They make do with what they have, just as people do, but do best in an environment that suits them (as do people!). Since we have a fairly short growing season here in the upper Midwest my goal is to get the plants growing strong as early as possible to get a good crop before the frosts and freezes arrive in the fall. Cucumbers are not fond of frost. PLANTING - Warmer climate gardeners plant their seed directly in the garden, grow and harvest cucumbers as they mature and don’t worry much about a freeze prematurely ending their harvest. But those of us with shorter seasons need to take a bit more care if we want enough fruit for pickling. You can start your cucumbers inside in small pots, transplanting them out later when the soil warms and weather settles, and I have done that successfully. But my small greenhouse space is at a premium in the spring and the less fussing I have to do with any crop the happier I am. And a happier gardener makes for happier plants! So I use cold frames. When the snow is gone from the garden, the dandelions are showing their cheery blossoms, the apple tree’s buds are swelling and the daffodils are in full bloom, it feels great to be out in the garden soaking up the sun, moving mulch and digging in the dirt. Many seeds have already found their way into their respective plots -- early greens, peas, carrot. Now it is time to set out portable cold frames for the squash and cucumbers -- usually about mid-May here. The cold frames suit me and the cucumbers. I can put them where I want them with little fuss, and the plants can settle in without worrying about having to move later. As I have permanent, mulched, four foot wide beds, my preparation means moving mulch instead of digging or tilling the soil. I rake the mulch off a bed where the cucumbers will reside so the soil can warm. The cold frame boxes are set out at a spacing of about three frames in 24 feet. A shovel of compost is dug into the top inches of soil within the frame and several seeds are planted in each quarter of the box. I cover them gently with dirt and, with a loving pat, leave them to do what they most want to do -- grow. When the seedlings are up and growing but still small, they are thinned to one plant per corner. This works out to about one plant per eight square feet which is a good spacing for the Northern Pickling variety. 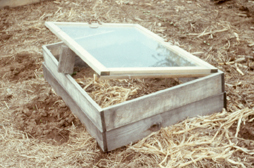 Since this is still about a month before our weather warms and frosts abate, the cold frame windows are closed at night and during cloudy cool days, then propped open when the sun shines. If temps really drop, the frame is easily covered with an old blanket or rug. This gives the crop a wonderful head start on the season without unduly pushing their comfort level. The most important job for the gardener during this time is to be sure to prop open the windows when it is sunny. Better to have a bit of cool than to cook the little plants. If I’m going to be gone overnight and I’m not sure of the weather, I’ll leave the cold frame closed and covered with a blanket. The plants do fine with a few days of extended dark. GROWING - Round about the second half of June the weather is usually settling into summer mode. The garden is starting to look like a garden and the cucumbers and other plants are happily growing. Except for an occasionally cold summer, the cold frames are taken off and stored away and the cucumbers are ready to spread out. It’s time to mulch. Not surprising, it’s also time to cut hay. Nature does work things out pretty neatly. Since we have fields, we cut our own hay for mulch. It’s wonderful to work with loose hay, and one can be sure to cut at the right time (before things go to seed). The old mulch may be raked back on the bed now, supplemented with new hay. 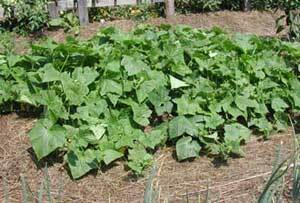 Or it may stay in the paths to keep weeds down there and the bed covered with fresh stuff, nestling up around the growing cucumber plants. Either way, the entire garden is blanketed with mulch by July and the gardener happily tends to other summer fun; the mulch pretty much taking the place of weeding and watering. The cucumber plants grow and spread and, other than admiring them, my only chore during this time is to direct enthusiastic vines out of the path and back onto the bed. HARVEST - Towards the end of July I can usually start eating cucumbers on my salad. Since I only grow pickling cucumbers, I simply peel them for eating raw. But fresh cucumber aficionados will, of course, have their favorite eating varieties and be raiding the patch when the first ones become of size, and from then on. But in the pickle patch we’re waiting for that time when there are enough little critters for a nice batch of pickles. This is why I grow cucumbers so “salad ingredient” is just a sideline. From then on it’s a game of watching and picking them before they get too large, yet having enough for a decent sized batch of pickles. 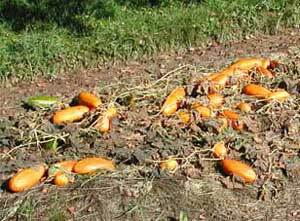 Those that become oversized are tossed into the compost pile. Thus does August progress; and on a rare mild fall, on into September. SAVING SEED - If you grow open pollinated cucumbers and a good number of plants (you want a reasonable gene pool, not just saving from one or two plants), saving your own seed is as easy as just letting some of the cucumbers of each plant mature. Cucumbers cross pollinate, so I grow only one variety if I'm saving seed. If you store your seed well (cool, dry, dark) it will be viable for many years so you don't have to save seed every year. If the plants and fruit are having a good year - disease free, generous production of fruit, good weather for maturing - I simply choose to leave a cucumber here and there to mature, usually the ones that escaped my notice and have already grown beyond the nice pickling stage. If it's a great year, I simply stop harvesting when I'm tired of making pickles and let the rest of the crop mature. Maturing cucumbers will turn yellow then dark orange or yellow and their skin/shell becomes less tender as they age, well past . Light frosts don't bother them even if the leaves are damaged and I leave them in the garden until hard freezes are predicted. I then bring them inside to set and further mature their seeds for at least several weeks (which isn't hard since I'm plenty busy doing other things this time of year). At some point before they get too soft and mushy I cut them open and scoop the seeds out into a bowl. There's usually enough juice to let them ferment (which takes care of that gelatinous covering on the seed and might take care of some diseases, too). If not, add a little water. Stir several times a day and let them ferment for several days. Then clean the seed. I do this by adding water, letting the seeds settle to the bottom, pouring off the debris. Keep doing this until the seed is clean, then strain and dump on a towel to remove as much water as possible. Spread out on a plate or cookie sheet and let air dry until they snap when bent. Old envelopes work well for seed packets (note the year and where you originally got the seed, as well as the proper name). Store in a cool, dry, dark place and you'll have more then enough seed for you and your friends for many years. PICKLES - There is hardly a need for me to give a pickle recipe. They are so prevalent that one could spend all ones days trialing pickle recipes and never run out, even should you live several lifetimes! Pickles have to be tops in the preserving category for fun, variety, sharing and friendly community. Cucumbers aren’t the only vegetable used for pickles, of course, but they are the top contender. When I’ve been short on cucumbers I’ve successfully used small zucchini and other squashes. Peppers and onions are often additions to the pickle pot, or maybe some broccoli. In each pint jar put 1 tsp mixed pickling spice (with cinnamon and cloves), some dill, a few small grape leaves. Drain brine off cucumbers, cover with hot water, drain. Pack not too tightly into jars. Cover with hot vinegar/sugar solution leaving 1/2” headroom. Lid and process as you normally do (boil-water-bath or steam-pressure-canner can) for 10 minutes. Or don’t process, if you don’t do that to your pickles. I used to, but don’t anymore. I make sure the vinegar solution is boiling hot, fill to about 1/4” headroom, put heated lids on the jars with rings just as if I were going to process them, then let them be. They seal and keep just fine, and it’s a lot less work. If a jar doesn’t seal it is obvious and that jar gets put in the root cellar and eaten early. All other precautions are the same as with any canning. *My favorite is when we have a bumper apple crop, make more apple cider than we can drink, and I make a large batch of good, strong apple cider vinegar to use for the pickles. It’s a flavor you just can’t get with factory vinegar and I cherish it when I have it. FERMENTED PICKLES - In the past we didn’t eat many pickles plain out of the jar, until last year I discovered “Fermented Brined Pickles”. Hardly new, of course, it is probably the original pickle. Most people are familiar with sauerkraut, but not so with other brined vegetables. But apparently the time was right for me to re-discover brined pickles. I happened on an old book in the library, read the section on fermented pickles and was intrigued. It sounded so easy, and I’m all for less fuss-more fun; so I searched some more. I searched through the large pickle section of the library and gleaned some information and recipes, and I searched online and found more. It’s not as common as canned or vinegar pickles, but there is a lot of good info out there (and passionate proponents) and I soon had a pretty good understanding of the process. Which is good when you are trying something new. What really interested me was the possibility of fermenting in the jar, not in a crock. 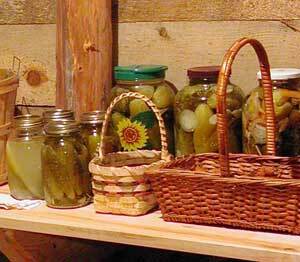 Well, we had a good crop of pickles and I had collected a good number of fermented pickle recipes. I was conservative and only tried six variations. Really, they were all pretty much the same, but a little more salt here, little less there, quart jar, gallon jar, small crock; no dill, some dill, lots of dill; grape leaves vs cherry leaves; onions and peppers in one, just cucs in others. It’s amazing how complicated you can make a very simple thing! But it was fun. And we loved the pickles! I made 27 quarts of fermented pickles and we ran out in February. And we are only two people (and two cats but they didn’t share our pickle passion). Granted, I did give many jars away as gifts, pickles seem made for that. But we had discovered a great new-old food. How wonderful that it was also easy and good. If you aren’t already a pickle fermenter, I’d suggest you research and read and get familiar with the process (which is easy) and methods (not many). But be prepared, home fermented pickles are not like always-the-same factory pickles. They are alive and change flavor daily from the day they are made until the day they are eaten, which is part of the fun, and delicious fun it is. Hopefully this year I will have a great cucumber year and have enough pickles to see how they taste past the 6 month mark (which is when we ate the last of last year’s pickles). Make a brine of 1 1/2 tablespoons pickling salt to 1 quart of water. Slice cucumbers into a quart jar, include some dill and grape leaves. 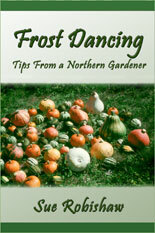 Cover to near the top with brine. Put on the lid and let set (on a towel is a good idea) at room temp for about 5 days or so, when the brine will be cloudy and definitely fermenting (little bubbles rising). Wipe off jars and lids, top with more brine if needed , and store in pantry or cool space which calms down the fermenting. Start eating whenever you want, and keep eating until they are gone. The great thing about the fermented pickle is you can easily make small batches as the cucumbers come along. Or large batches even if you’re busy with other things. They don’t take long. You can use whole cucumbers, quartered cucumbers, sliced cucumbers, other vegetables. When a bunch of cucumbers were ready to be picked but I was busy with other things, I quickly picked and washed them, put them whole into a small crock and covered with brine. A small weighted plate (a glass jar of water works well) keeps the cucumbers beneath the brine. Place a cloth cover over the whole and let it set and ferment as with the jarred pickles. Then later at my convenience I sliced them into jars. You can ferment in the jar or in a crock. But if you ferment in a crock, you have to skim the white scum off regularly which is why I prefer the jar method -- it’s easier and less messy -- the scum doesn’t form. One change I will make this year is to use plastic canning jar tops for these pickles. The brine did a number on my regular metal rings and I’ve had to toss quite a few of them (salt water and metal don’t mix). But since these pickles don’t need to be sealed, you can use those neat looking old-fashioned metal bailed jars (Lehman’s Hardware carries the rings if you need new ones), whether they are of old or new make. As a bonus, the fermented brine is wonderful in itself -- used in biscuits or breads, dressings or sauces, soups or sautes. It adds an extra something which is hard to describe but is missed when it is gone. But by far the hardest thing about these pickles is waiting long enough for some flavor to develop before eating them all up. And keeping some for gifts and for later eating. It’s a problem I can live with. originally printed in the July/August 2009 issue of "Countryside Magazine"